A new apple found after a hurricane? Learn the history of Gingergold apples. Gingergold apples have a hurricane to thank for their discovery; here you will learn the history of Gingergold apples. Hurricane Camille hit the east coast in 1969 devastating many Virginia apple trees. As orchard owners, Clyde and ‘Ginger’ Harvey, worked to salvage what they could from the damage they discovered an apple tree that was different from the others. It was planted with the remaining trees but produced a yellow fruit rather than red. After some research, it was determined that the apple is a cross between Golden Delicious and Albemarle Pippin. This is yet another apple that is named after the wife of the discoverer! Gingergold is a mildly sweet apple with a tart finish. 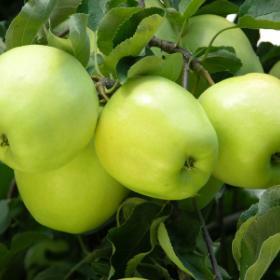 The apple starts out pale green and yellows as it ripens. Gingergolds are a great eating apple and work well in pies and salads. Come to Apple Holler to try out some Gingergolds! Click here to see when they are ready for picking! What’s even better than Honeycrisp apples? Premier Honeycrisp apples!